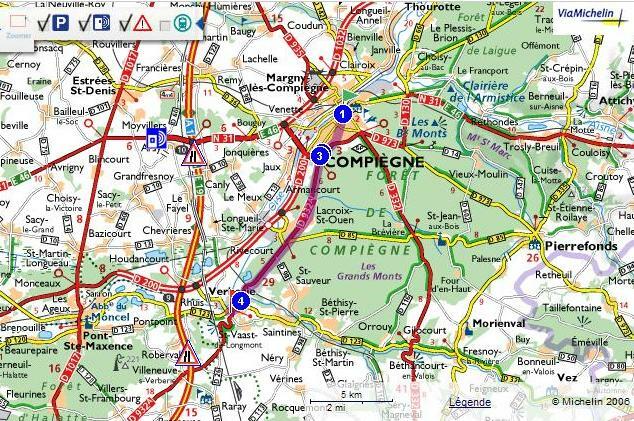 Coming from Compiegne, at the second traffic lights, follow “A1” and turn left after the church. Coming from Pont Ste Maxence, take « rue de la République » then turn left in « rue Desormes ». Coming from A1 follow « Compiegne »; at the 2nd stop take « avenue du Général Sebert », then turn right in “rue St Pierre” and then left “rue Gustave Bouffet”. Coming from Senlis, follow « A1 » as you turn left at the traffic lights. Then turn left after the church.